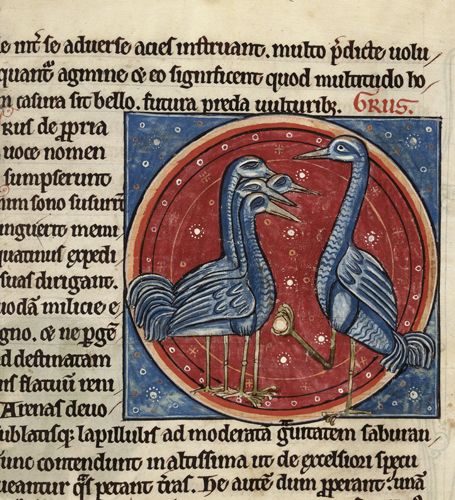 Detail of a miniature of cranes from a 13th century bestiary with extracts from Giraldus Cambrensis on Irish birds. 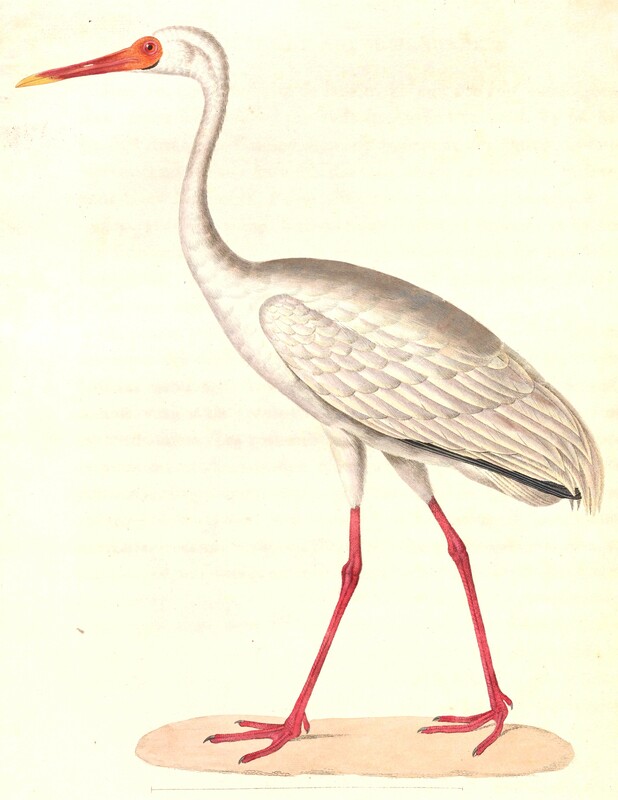 The text, found in the British Library, states that cranes took it in turns to sleep! This image shows four cranes sleeping while the fifth stands on one leg with a stone held in its other claw apparently so that if danger approaches it can wake the others. We continue the inquiry of finding family- the investigation into morphological and etymological relationships, of base elements developing from the same source, a shared root, and the nuances of meaning each word springing from this source brings. Students share their research and findings in webs and matrices ( see previous post). The representation of the relationships between base and root and other words sharing the base element has been an interesting challenge. Aiming for depth of thought is inevitably less appealing than the desire of some to ‘finish fast’. These ‘fast finishers’ often fail to search thoroughly or ask questions. Popova discusses perseverance reminding us to ‘expect anything that is worthwhile to take a long time’. This insight is so important for both me and my students to recognise in order to work against the ‘140 character culture’, our culture of ‘entitled impatience’. Often word inquiry, therefore, is as much an inquiry into thinking, research, self discipline and persistence as it is in into morphology and etymology. There has been much clamouring of: “Is this right? Is this right?” an insidious refrain that immediately shuts down thinking by placing the teacher as the expert and ‘the right answer’ as the holy grail of their quest! The challenge has been to avoid quick morphemic analysis as students construct matrices and thoughtless grabbing of words that coincidentally share the same strings of letters but not the same roots. Listen to the student below sum up her group’s early research and their discoveries on this journey. Compare their initial hypothesises to the web they created later for Latin <ligare>. You will note they reconsidered <lic> as a potential base when they realized the impossibility of <-tor> as a suffix! They also reconsidered <lig> as a base- see their web. Several groups have reinserted a single, final, non-syllabic <e> at the end of their base element so that analysis of <punish> , formerly<pun+ish>, has become <pune+ish>. Using the suffix checker from Real Spelling, students examined their word sums and matrices arising from these morpheme divisions to ascertain the ‘soundness’ of their hypothesises. Students know that a vowel suffix has the potential to remove a non-syllabic, final <e> or to cause a single consonant preceded by a single vowel suffix to double. So following the initial hypothesis of <pun> the result when adding a vowel suffix, <-ish>, would be :*<punnish>. When confronted by this result there were mutterings of “That’s not right!” I asked was there anything that might prevent this from occurring? At no stage did they take the easy route and claim this to be exception.They recognize that there is a logical reason for the orthographic structure of all words in English. They may not know it at the the time but they know enough from their year’s forays into morphology and etymology to anticipate there will be a clear reason for a word’s orthographic structure- the word certainly will not be an ‘oddball’ or a ‘demon’!!! I gave students time to mull over this, suggesting they examine words like: <conspiracy> and <inspiration>,<hit+ing> and <take+ing>until they realized that the <e> can prevent consonant doubling. There is a stronger awareness now of the several functions of a final non syllabic <e>. Here’s how Shea presented his understanding of the journey the words <sensitive> and <dissent> into English. How do we analyze <furl>? Is <fur+l> possible? The benefit would be to show its compounded past and connection with L.<ligare> and the host of other words derived from this root.Is the <l> today in present day English, a base element? So far no other words other than furl, furled, unfurling. It had been easy to prove the <e> in <quire> from words sharing the base element such as <inquire> and <require>. Groups puzzled over <quer> or <quere>. Here is a synopsis of their thinking :<qu> is considered a single entity as the grapheme < q> never occurs alone in English. This then explains why <quiz+es> is perfectly logical as <quizzes>. Therefore, the base element must be <quere> as <quer+y> would be *<querry>. Hence <quere+y> is logically <query>. While one group postulated <sens> as the base element for <consensus> and <sensible>, it was finally the word <sense> itself that proved the existence of the final, non-syllabic <e> whose role in this word students saw must be to prevent plural confusion. The suffix <-s> is a frequent indicator of plurality. Questions now abound around the suffixes: is it <-ite> or <-it>? We have know of habit from Latin : ‘habere’ to have, to hold which is the root of Latin frequentitive of ‘habitare’. Is inhabit then <in+habe+it>? However, we have <prerequisite> and <requisite> which is analyzed as <pre+re+quise+ite>. It was these words that ultimately led us to conclude the suffix to be <-ite> in the regards to the <quise> base. But what about words such as <sensitive> <sensitize>? We need to understand how this suffix operated in Latin. 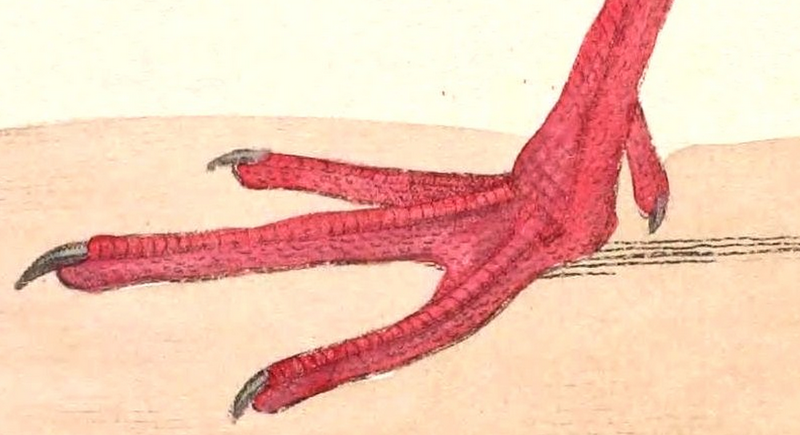 And by now dear reader, as you regard the image above, no doubt you are puzzled as to the splayed bird foot! The foot belongs to the bird below. Still none the wiser? Consider the word <pedigree>. How is this analyzed? We hypothesized <ped+igree> adjusted this to <pede+i+gree>, reinserting the final non-syllabic <e> to avoid doubling the <d>. We thought of <pedal> , <pedestal>, <pedestrian> and <pedicure> all from Latin pedem, the accusative of L. pes meaning foot. And the root and meaning of the <gree> morpheme? Look carefully at the image at the beginning of the post to see written in red, the Latin etymon <grus>, nominative form of <gruem> meaning crane. So ‘pedigree’ in the literal sense means a ‘crane foot’. This not only refers to descent and idea of being pure in lineage, but also the recorded ancestry or lineage of someone. Genealogy diagrams show branching lines similar to the imprint of crane feet. Look for the crane like feet in the illuminated genealogical table below and note our crane like feet in our word webs! This section begins with Harold II (d. 1066) shown in a single roundel. He claimed to be the rightful successor to the throne after the death of the childless Edward the Confessor, his predecessor. Read more here . Mathew Paris: Monk illustrator and scribe,’journalist’ commentator of his time. 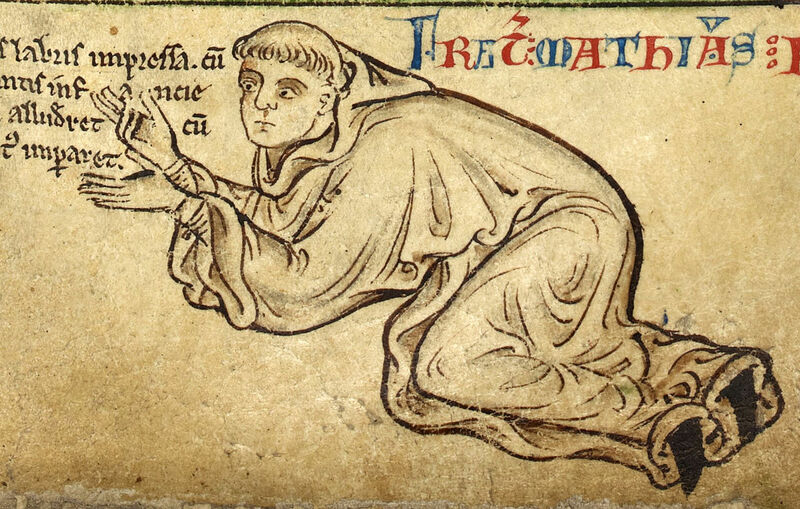 I was thrilled to discover that the image at the bottom of this chronicle was of the remarkable Mathew Paris (1200-1259) monk, illuminator and scribe. If you, like me are enchanted by an illuminated manuscript, then watch BBC Illuminations The Private Lives of Medieval Kings to understand how power and justification of kingship were represented in these manuscripts. Footnote (!) I just have to state that inquiry into the PIE root *ped provides a wonderful excursion with many word gems as a reward for student or teacher inquiry! I would like to ask my classes before the end of the year: What are the connections between cranes, feet and pawns? Explain. Here follows a tantalizing preview of what lies ahead in such an inquiry, a quick gallop of amazing findings after several entertaining hours spent reading and following leads in the OED yesterday! The PIE root *ped led to the Old English etymon ‘fót’ and the accusative plural fét ‘ (OED). (The Online Etymology dictionary states that the plural ‘feet’ is an example of i-mutation- don’t panic read more about this process in Harper’s account here and think man-men, tooth-teeth. Ancient PIE *ped has led to Latinate roots pedem, pes, resulting in the base element <pede> in English, Greek πούς genitive ποδός foot, πεζός has led to the bases <pode> <pus>. Compounds: Foot as a base element has provided many compounds: footwear, footsoldier, footsore, the noun foot-swather attested in1762 in Oliver Goldsmith’s Citizen of World I. 7: ‘Your nose-borers, feet-swathers..would all want bread, should their neighbours want vanity.’ (OED). Keats in Endymion referred to Mercury as ‘foot-feathered’. ‘Foot-fastness’ refers to captivity, foot-halt is a disease attacking sheep, a foot-land-raker is a footpad and Johnson gives us foot-licker: ‘a slave, an humble fawner, one who licks the foot’. Phrases:Then there are the phrases: ‘footloose and fancy free’. Initially in the 17th century this meant free to move the feet, the broader sense of without commitments occurred in the 19th century and then the addition of ‘fancy free’ expanded the sense to an object of someone’s affection. Other phrases include: feet of clay, have or keep your feet on the ground, put your best foot forward. You ‘take the weight off your feet ‘or ‘put your feet up‘ in order to relax but ‘put your foot down‘ to emphasise a point or take a stand. The feet are ‘handy’ for metaphors expressing awkwardness or error: ‘to put your foot in it’ or ‘foot in your mouth’. Nervousness or hesitancy is indicated with ‘cold feet’ and to ‘dig in your feet or drag your feet’ can indicate reluctance or stubbornness. However to ‘land on your feet‘ , ‘fall on your feet’ can show luck or fortune, while to be ‘run off your feet’ or ‘wait on someone hand or foot’ or ‘walk someone off their feet’ leads to exhaustion. To ‘play footsie’ with someone is to indicate a romantic or cosy relationship and ‘to sweep someone off their feet’ is to overpower with romantic charm but ‘to get itchy feet’ or ‘shake the dust off your feet’ means impatience or wanderlust. Fetter from Old English fotor started as’ A chain or shackle for the feet of a human being or animal’ and broadened to take on the expanded sense of anything that impedes or restrains’ (OED). Fetch from Old English feccan too links back to this PIE root!! The <pede> base has been rich source of foot words:impede, and expedite (15th century) meaning, at the literal sense, to free the feet from fetters thereby to free from difficulties. An aliped is wing-footed, biped-two footed,while capriped is goat footed;or satyr like. Ever had the feeling of hot , burning feet? This is ignipedites while lassipedes– is to have tired feet. A pedestrian may at times be pedetentous, proceeding step by step or advancing cautiously. There are several conditions that would make one concerned such as being described as pedimanous – to have hand like feet-such as lemurs,while being remiped, having feet that are oar shaped, would be useful whilst swimming but potentially unattractive out of the water! Did you know that pedomancy is divination by the soles of the feet? And who would have thought the humble pawn, the foot soldier of the chess piece, too had foot origins?!! . Likewise peon and also pioneer, originally foot soldiers preparing the way for the army, later broadening to anyone going first! The base element <pode> from the Greek root too has led to many fascinating words that I wished I’d known before: so many foot worries such as brachypodous: having abnormally short feet, cryapodia, having cold feet, dolichopodous, having long feet!